It doesn't take a rocket scientist to do the math. (1 tired Dad - 2 Kids dropped at in-laws + 1 hotel room + 2 shades drawn + 1 Do Not Disturb sign + 1 Melatonin) = 11 hours of sleep. So I woke up refreshed in Huntsville, and prepared for my second annual solo summer sojourn to Louisville. 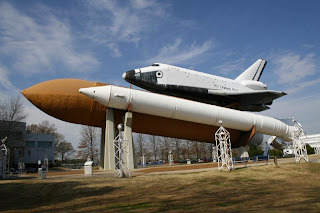 So I hit the road by way of US Space and Rocket Center. I figured traveling through space is what my kids will do instead of us old-timers who wait in airports and occasionally get to hit the open road. So how about space camp? Now that's the ultimate open road. From there, my GPS took me on backroads back to the interstate. Apparently I crossed into Tennessee and didn't even know it. Maybe they were embarrassed that a couple more Volunteer football players just got arrested. And I thought the new boss was nothing like the old boss. But it was in Kentucky, just 90 minutes from my destination, where the smooth sailing ended. Was it an accident or a crime scene? Maybe US Deputy Marshal Raylan Givens had another Justified shooting. This was the picture for over 3 hours in the mid-to-late afternoon on I-65 in Kentucky. Apparently while the road was still slippery, a compact car was wedged under a semi about a mile ahead. Timing is everything in life. If I left 10 minutes earlier I never would have been caught up in this. But if I left 5 minutes earlier, I might have been killed. I was just two miles from the exit and woefully short on gas. The shoulder was unavailable because at least a dozen cops and emergency vehicles were occupying it. The exit 3 miles behind us was where the traffic south of us was being detoured so I couldn't afford to be idling with a near-empty tank. Thankfully, the kids weren't with me. I used up all the juice on the cell phone, portable DVD player, and the laptop and didn't want to start the battery since I had no idea how long I'd be sitting there. Mercifully, just as the mosquitos descended, the traffic started moving. I made it to the exit before running out of gas, and pulled into your friendly neighborhood British Petroleum station. When I coasted in, Jackson Browne's "Running On Empty" was playing on the loudspeaker. Maybe things do happen for a reason. Just like wheeling in to Louisville just after dark, and fireworks lighting up the skyline for my arrival. Maybe space is overrated. All the action's down here. Hang in there! The last traffic dead-stop I had, I played hacky-sack with a truck-load of Mexicans on I-95 just outside of Wilson, NC. Women were hanging it over the guardrails and letting fly. A further Justified note: Boyd plays the serial killer in the new Predators. Talk about being typecast.